I get asked weekly (at least) what the best reusable stencil material is to cut with Silhouette. I'm gonna be honest, I'm always kind of "eehhhh...well...um...". Well, my friends, I'm pretty stinkin' sure I just found it in the most unlikely spot! So a few weeks back I cutting some laminated pieces with my Silhouette...when I made what I'm considering the discovery of the year. After I cut the laminated pieces out I was left with a nice piece of lamination material with some perfectly cut shapes in it...and hello, lightbulb moment!!! 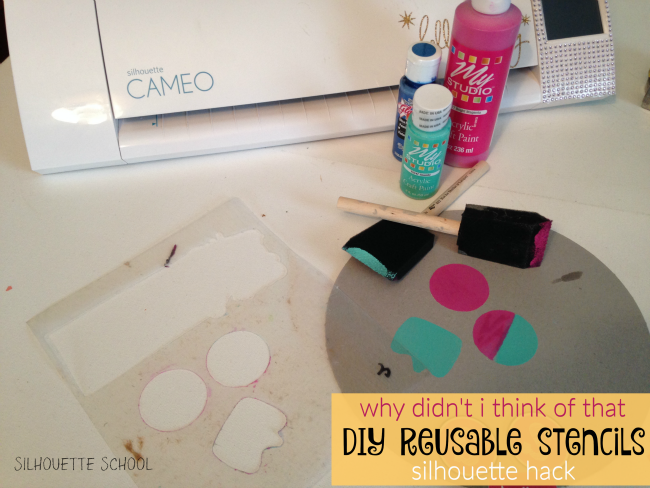 So, here's how you're going to make reusable stencils with your Silhouette. Of course now that I have a laminator I'm finding every excuse in the book to use it in combination with my Silhouette (I've already made bookmarks, luggage tags, planner inserts) and this little DIY stencil bit is just the latest. I discovered this crafting hack while making some laminated paper pieces, but to make the stencils we're not even going to laminate anything. You're simply going to put the laminating sleeve through the laminator empty. This will, of course, seal the two sides together making a nice rigid, but not too thick sheet. Then you're going to prepare to cut that sheet with your Silhouette. 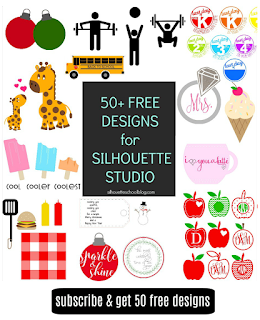 Open up Silhouette Studio and find the design from your library you want to turn into a stencil. 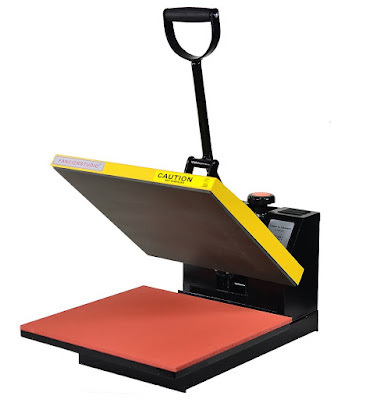 Size it and make sure it's on the virtual cutting mat in the same area where the laminated sheet is on your mat. 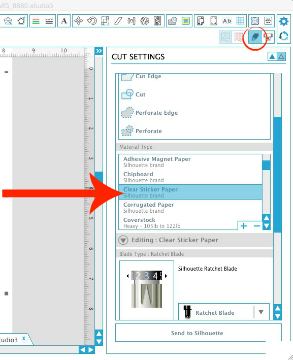 Open the Cut Settings tool (right) and from the material list pick "Clear Sticker Material." The defaults here work great with the laminating material, too. Blade on 3, Speed 4, Thickness 33, Double cut. 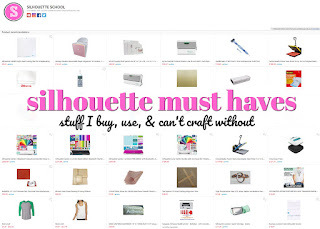 Don't forget to change your actual blade, load your mat and then 'Send to Silhouette." Cuts like a dream, right? Okay now you have a nice stencil...but there's one more step that's really going to blow your mind. This is optional, but oh so helpful: run the stencil through the Xyron sticky machine to put an adhesive on the back. You could also spray the back of the stencil with repositionable adhesive spray or just leave it without any type of adhesive. The adhesive just helps keep it in position while you're painting. Now you're ready to place the stencil and paint. You could put it on a shirt and use fabric paint or on a piece of wood or canvas or even the wall! When painting with a stencil, I always recommend blotting on the paint with a foam brush rather than making strokes which can push the paint under the edge of the stencil and cause paint bleed. When you're finished painting simply peel up the stencil...and admire those crisp paint lines! Use a damp paper towel to wipe the excess paint off the stencil and you can use it again and again. I mean..I'm pretty proud of myself for that one! Is that not the best way to make reusable stencils with Silhouette...ever? One final tip, when the adhesive on the back of the stencil isn't working to hold your stencil in place anymore, just run it through the Xyron again or hit it with some more spray adhesive. 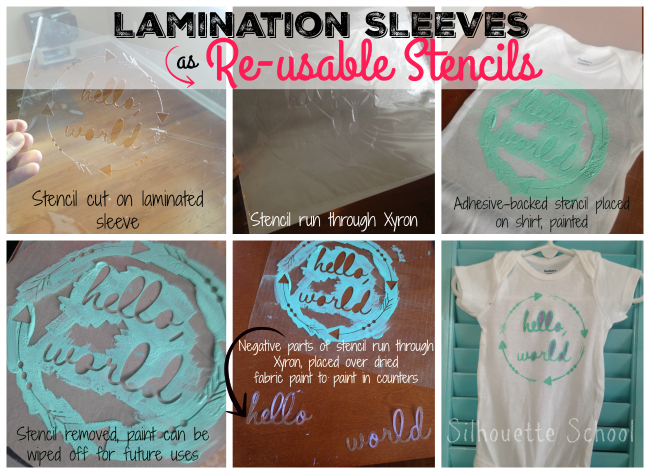 And here's a look at how I used a laminated sleeve as a re-usable stencil for fabric paint. Hi, I just did the very same thing last week - with two lines of text. It was used on placemats - and it worked just fine, even with kids and without adhesive on the back! I use my laminator to laminate recipe cards I've gotten from friends and family. It is nice to be able to use grandma's recipes but keep them nice so I always have them written in her handwriting. Also, tags for kid's backpacks. Clever, I did something similar as a teacher I used the scraps from laminating school materials to create stencils. Then we didn't have machines to do our cutting so used an x-acto knife and later used punches to create the designs. Thank you for this tutorial. My husband would say use what you have for now since I just invested in several mats etc. 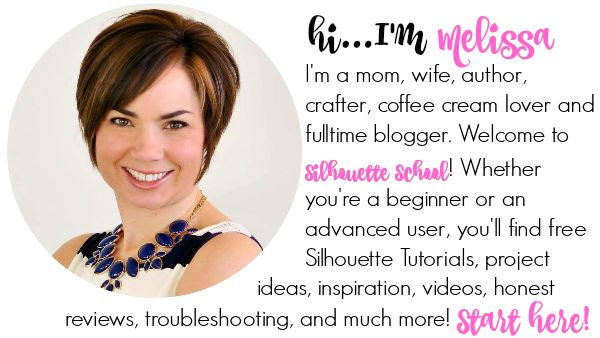 I would love for you to tell us how to use the hobby lobby stencil blanks called show - offs and maybe the deep cut blade. I appreciate all that you've shown us. I like the laminator idea just would like a larger reusable stencil. I am interested in knowing more about the hobby lobby stencil blanks. Can these be used on the Cameo and do you need a deep cut blade? This is brilliant! Thank you for all you to do make our lives easier!! Question: Do you think this would be good for etching?I was just about to try etching with a dollar store glass trivet. I figure if I mess it up, it won't matter! wow,wow,wow! Now I can use that laminator I bought that's barley been out of the box for something fun.Thank you! This is such a cool tip! I've just become interested in art journaling and I can see so many possibilities for creating my own stencils now ~ and so cheaply! Thanks for posting this! Hi Melissa, Thank you for sharing such a great tip, I will be trying this soon.Cheers Anna. Another awesome tip! Thank you!! Thanks for your wonderful school. 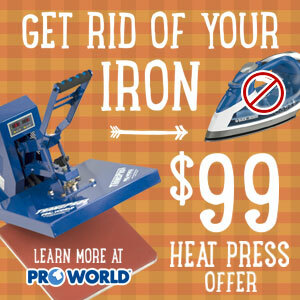 I am also interested in your reply to "would this work with etching." one question, my laminating sheets are two sheets hooked together, are you just cutting them apart and using one sheet? or laminating them together to make 1 really thick sheet? She mentions that she fuses both the top and bottom piece together - like you typically would when using a laminator, except minus whatever paper you are trying to laminate. 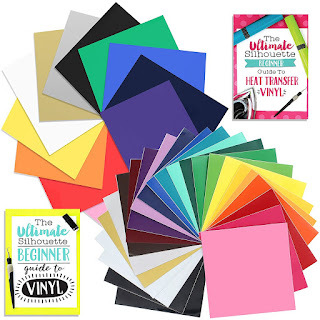 Run it through your laminator, so you get a sturdy, thicker sheet ideal for cutting stencils. You know, I have a lot of DIY craft tutorials or idea sites hit my inbox all the time. Most of them I finally unsubscribe because they don't give good instructions or I don't end up liking the projects or I just get bored. But dang it I like this Silhouette School! You come up with more ideas, work out the kinks of the process and then give us great tutorials. Thank you! You do realize though that now you can't ever stop, right? Absolutely a great hint! How clever you are, Melissa, and a great teacher, too. Just to clarify, you are using a repositionable adhesive cartridge in your Xyron? Thanks! Ok you lost me, did I miss a step or a class about the lamination machine? I just ran out of my roll of laminate, never used a machine with it. How big is the machine? She is just referring to your regular ol' run of the mill laminator that you see at office supply stores... you know taking clear contact paper to the next level. Not something that was created specifically for the Silhouette or die cutters. Now I'm so excited t get home and try out my laminated sheets. I have had my laminator for years for other uses and purchased my Cameo so I could primarily make my own stencils. I know when I have purchased laminator sheets they come in different MIL weights. Was there a certain weight you recommend? I bought my portrait to make stencils for mono printing with a gelli plate. I have made stencils using stencil material cereal boxes, one side of plastic file folders, card stock, but haven tried the laminator sheets. I started to get one when someone suggested several uses with the cameo but don't really know if it's worth getting as I don't laminate many things. Hi, here's another suggestion - it doesn't make a reusable stencil, but it does make a CHEAP and ACCURATE stencil - where I'm from we call it contact paper - the stuff you adhere to shelves or books. Not the transparent stuff, but one with a pattern or a solid colour. It's available at most paint or hardware stores and cuts the same as vinyl - but is MUCH cheaper, so you don't feel bad throwing it away. It's adhesive too, so is great for stenciling fabric. I luv your tutorials; they are so easy to follow. Well most of them I should say cuz I'm still a newbie and don't know my cameo that well yet so I still make mistakes. But this tip is a great one I used already to make a stencil to mimic a bought design when the shirt didn't fit. I had to use double-faced pellon to reattach it to a new shirt. The design was copyrighted for a retreat and I didn't want to shell out $$ for a second shirt. It turned out great; I was able to construct a stencil with my silhouette and cut the pellon mat'l on the silhouette also. I am learning lol. Thank you, thank you, THANK YOU for sharing this idea! I cut a bunch of stencils from other material and was not happy with the way they came out, but did not want to buy stencil material. I tried laminating sheets like you suggested and they work beautifully! Awesome. Did you use the cutting mat? I have the laminate sheets and have run them through the laminating machine but when I use the same settings you listed the cameo tears the sheets, I have changed the blade to 2 but it doesn't cut through... My machine is only 3 weeks old! Help what am I doing wrong??? Thank you so much for saving my dream. I am designing stencils to sellin the interent. I was having unpredictable results cutting 7 mil stencil blanks on my Cameo, and having to do 5-6 passes! These laminator sheets cut pretty cleanly on 2 passes (blade set to 3 and then 4 on the second pass), I can live with that! Seems sturdy enough for a product to sell. 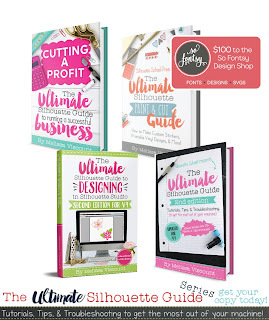 A thousand blessing on your craft table. OK - so I found a stencil plastic from our friends at HL and cut a stencil with that. It's a thicker plastic, I'm using it for something other than paint, but wanted to tell you what I did. I set my blade on 5, used a custom material setting in advanced cut options, then checked the double cut box. Worked great! I am a teacher, having used my laminator A LOT!. Great to know that I can use it for Stencils too! Does the adhesive make the project sticky? Melissa, you are the best!! I have spent a fortune in stencils and they are usually flimsy. I would never have dreamed that I could make my own with laminating film. Thanks for the tip and the excellent instructions. Excellent find! Thank you, I was making stencils from vinyl, but they lasted fot 2 or 3 times, after that they broke. This is a perfect thing!